Retro Friday is a weekly meme hosted here @ Angieville and focuses on reviewing books from the past. This can be an old favorite, an under-the-radar book you think deserves more attention, something woefully out of print, etc. Everyone is welcome to join in at anytime! 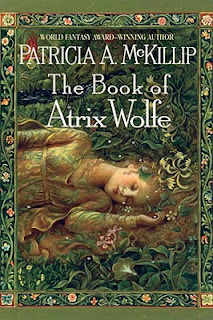 It was my friends at Readerville who convinced me to give Patricia McKillip a try. This I remember very clearly. I'd never read any of McKillip's books, though I'd run across them plenty of times what with her books being shelved right next to Robin McKinley's on all the shelves ever. And then there was the matter of her covers. Somewhere along the line, they paired her up with Kinuko Craft and decided it was a match made in heaven. For the most part, I think it is. Craft's luscious, romantic dreaminess blends perfectly with McKillip's sort of stream of consciousness fantasy. Occasionally, I long for something a bit more solid and grounded on one of her covers. But they do fit the bill in the What You See is What You Get department. I started off with The Riddlemaster trilogy and was instantly enamored. Where had this writer been all my life? I loved Morgan of Hed with the three stars on his forehead and the High One's Harper at his side. I could not get enough of that trilogy and still wander into my library from time to time to stroke the pretty omnibus edition I own. Utterly epic in scope, the Riddlemaster books set the bar high. And while I was a bit surprised to find her standalone volumes somewhat quieter affairs, I was no less impressed with the writing and reach. The second book of hers I read was this one. The Book of Atrix Wolfe. Sorrow is a word that means nothing until it means everything. In a world where the mortal and the magical exist side by side, a young mage killed his king. Desolate from what he'd done, Atrix Wolfe retreats to the woods. Living as a wolf, he hides from the horror of what he wrought. But the Queen of the Wood is not about to let him disappear completely. Not until he performs a task for her. Find her daughter who disappeared into the world of men at the same time as the massacre. Meanwhile, in that very world of men, a kingdom is at war. Terrorized by a horned Hunter, the beleaguered land of Pelucir struggles to survive. Until their orphaned prince Tallis unearths a book without a name. A book whose spells do not always mean what they seem. And behind it all, a girl named Saro scrubs pots in the kitchen below the castle. They called her Saro because she cannot speak. Because her eyes are full of sadness and she has no words to tell them where she came from. But Saro hears everything that goes on in the castle as the swirling parade of rich foods and savory concoctions make their way from her domain up to the feasting tables above. And her part to play in the raging conflict between mages and armies, between mortal and immortal, will not be a small one. There are no simple words. I don't know why I thought I could hide anything behind language. The Book of Atrix Wolfe is one of Ms. McKillip's headiest designs. From the decadent descriptions of castle cuisine to the throbbing lyric of losing your voice and finding it once more, I was buffeted about by beauty. I may be something of a sucker for books titled after an actual book within the book, if you follow me. Ever since The Book of Three and The Neverending Story. Which is probably what prompted me to pick this one up after The Riddlemaster to begin with. What landed it on my keeper shelf its layers upon layers of meaning. A book about a book. Beautiful words used to explore the value and power of language itself. The spiderweb of horrific events that creep out from one moment of impossible hubris. It doesn't hurt that there are living trees and shapechangers and medieval mythology galore. But it's the tapestry of words, in the end. Someone living, he realised early, who had not been scarred by the siege or haunted by memory, was valuable to the storytellers. Having no memories of his own, he became their receptacle for memory, and, with his untroubled past, for hope. Being a living receptacle for memory and hope. That is imagery worth your while. McKillip books are always worth your while. But this one is special. I hope that you read it one day, not only because the words are wondrous and the magic is tangible, but because reading it is like falling into a bed of soft linen and waking the next day to find you've dreamed, oh, the most beautiful dream. Awesome. This is one of the few McKillip books I haven't read (for me, the first was Riddlemaster, and the The Changeling Sea and I adore both) but I'm going to have to change that now. I can't get enough of her writing. I just got the latest collection of her short works -- Wonders of the Invisible World. I'm not as fond of her short stories as I am of her novels, but I'll take what I can get. Riddlemaster and The Changeling Sea are my tops as well (along with this one). I haven't read any of her shorts, actually. My favorites are Od Magic, Alphabet of Thorn, and The Bell at Sealey Head... with honorable mentions going to Riddlemaster of Hed and The Changeling Sea. She really is an incredible talent... it's hard to choose! It is, isn't it? I enjoyed each of those, too. She's quite prolific. Thanks for the wonderful review! This sounds like a fantastic book. I recently read my first McKillip book, her short story collection Wonders of the Invisible World. I had the same reaction of, "Where has this writer been all my life?" you describe and am definitely planning to read some of her other books. I'm going to add this one to my wishlist, which is quickly becoming full of McKillip books. Yeah, I would definitely point you this way. Along with Riddlemaster and The Changeling Sea. So exciting!! It's so nice to see one of my favorite authors getting love! It's years since I read this one and the details are all gone, but I remember it being a favourite. Now you've made me want to read it all over again. I just wish more of McKillip's books were available as ebooks and at much more reasonable prices. It's been awhile for me as well. Such a dreamy tale, but it's lingered with me for years. Agree with you on the ebook front. Ohhh I remember this book. It's been ages! I went through a McKillip phase and read several of her books. I NEED TO DO THIS AGAIN. Thanks for the reminder! You do?? Awesome. I did the same thing. Just cut a huge swath through her backlist in one big gulp. Good times.